Yes, maybe. But what if Rogers is wrong about “a thin layer of carbohydrate impurities”? Scientifically speaking, this is not the main objection we can have concerning the coloring results obtained by Di Lazzaro and his team. No. According to a Shroud specialist like Ray Rogers (who knew one or two things about radiation and its effects on linen fibers), the main objection would be that it is virtually impossible for a mechanism like a burst of UV light (or any other burst of intense radiation like heat, proton, neutron, etc.) to only color a thin layer of carbohydrate impurities that is resting on some linen fibers without, at the same time, coloring the first wall of those fibers and leaving distinct damages there. For Rogers, this kind of coloring result that would affect and color not only the impurity coating but also the fiber itself IS NOT the same kind of result as what he observed on the samples he took in the image area of the Shroud. Again, we can say that even if something can look like the image on the Shroud, it is [erroneous] to say so if the results obtained do not match with ALL the chemical and physical properties of the image (or in this case, of the color). In the case of Di Lazzaro’s results, if we believe the expert point of view of Rogers, they don’t, even though the coloring results he got are looking quite similar (at first sight) to the color on the Shroud. I’m afraid science has to look at a much milder process (probably natural and coming from the highly traumatized corpse that was inside the cloth) to explain once and for all the image on the Shroud. Phase contrast microscopic view of image-bearing fiber from the Shroud of Turin. The carbohydrate layer is visible along top edge. The lower-right edge shows that coating is missing. The coating can be scraped off or removed with adhesive or diimide. Apart from a few idolators for whom questioning experts is anathema, serious doubts have been raised about this layer by authenticists and non-authenticists alike. – Water McCrone detected red ochre and starch. He was wrong about the first but correct about the second. – Heller & Adler did not detect any vanillin or any starch. They were right about the first but wrong about the second. 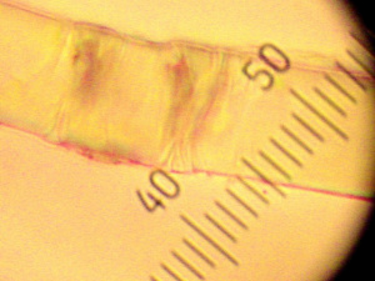 – Rogers himself detected starch on the Raes fibres. But then concluded that the Raes fibres were not part of the Shroud anyway. Perhaps someone could clear up these inconsistencies. Ray Rogers sought answers in the Maillard effect as one ingredient, impurities and so on. It was a positivistic approach, but what if he was wrong? Jesus was not the only one crucified during the period, hundreds were nailed to the cross. As I pointed out earlier, the (Hasmonean) Jewish king Alexander Janaeus crucified 800 Pharisees in 86 BC, and at least some bodies were laid in tombs. Was Jesus’ tomb particularly hot or different in some other way? Were other Jews placed in air-conditioned tombs? If Rogers is incorrect about an impurity layer, the problem of the affect of radiation on linen means this method of creating the image is impossible based on his chemical examination of the Shroud fibers which did not sustain the damage this expert would expect. Hence it really doesn’t matter if there was an impurity layer or not in terms of radiation. It is impossible for radiation to have caused the image, period. Note that I said “radiation-like” and not radiation in my question and this was due to the fact that laser was used in the experiment to obtain Shroud-like colouration. My emphasis was to determine the speed involved in the process. If I am not mistaken, Dr. Paolo Di Lazzaro had performed his calculations about the speed of the alleged phenomenon (and those calculations are rightly based on the speed of light in air and inside the linen fiber), namely: the glorious Resurrection Jesus from the dead! But now I do not remember well (ie: exactly) what was the result he had obtained, however (if I’m not mistaken) Dr. Paolo Di Lazzaro argued that the phenomenon Resurrection (seen in its concrete manifestation, in textile fibers) has had a speed that is connected to that of the Light … and up here we can also agree and try to deepen ourselves the problem (which is related to the formation of the surface layer on linen fibrils, the same layer that after aging turns into the “ghost”, a material that can fall … and of which I have spoken in an other message [linked to the strange “gopic hand test” = a vibrational test] that you can easily read). I think that might be interesting. is instantaneous because it requires a certain amount of time (little, IMO. the exact energy threshold to overcome…). period of exposure to air …), so that the B.I.F. problem seems to be even more complex. So you have to identify the points on which to pin power. to the interaction of light energy with natron and calcite (and iron oxides, dusts). of the Image ? I don’t know, I have some doubt. We require calculations and more exact experiments. to have been taken into account in the interesting research conducted by DiLazzaro. can produce certain effects on branes. And at the moment this is only the vaguest conjecture. to the SPM controls… in order to obtain a scientific certification. >Although these speculations are a bit strange in the eyes of the profanes (and see also [for example] the harsh criticism about the “sins” made by “Shroudology” that now we can read in the famous book Nicolotti, published in Italy by Einaudi), I think that might be interesting to do the inherent complete calculations. I think my attemp of correction is acceptable. (= a “popular book” published by Priuli & Verlucca, Italy) Dr.
Paolo Di Lazzaro is not mentioned in the index … and the same with Eng. Fanti, but there are some words about Eng. Fanti, Dr. Rogers and Riggi in this new book (instead Riggi, Rogers, Gonella, Balossino and Dr. F. Zugibe were mentioned in the Index). Do you know what is Gopichand/ektara, an indian instrument? >The ektara is constructed from two strips of bamboo, from the same piece of bamboo which has a cap on the top of the instrument. >A single string travels in between is connected from the top to the membrane. the membrane of the ektara would have a flexible bottom cut from animal hide, lizard skin or often more commonly elastic synthetic materials. >A single wooden wooden tuning peg is hand carved and inserted into the top. from Bangladesh, India, Egypt, and Pakistan. will be the answer to this test. a curious idea (a figment of my own invention). (on this “vibrational argument”) to be made available to all? the vibrations are not a figment of human imagination. linen fibrils coming from the Holy Shroud!) under examination. the particular “gopic hand test”). then the fibrils involved in the change should have certain characteristics. So the task of the research is to carry out the appropriate analyses. What is you idea on the matter? So many contradictions, so many uncertainties, so many unknowns, inaccessibility of the object of enquiry, so many personal agendas, authenticists and non-authenticists can never agree. Cause of the image, nature of the image, its peculiar orthogonality, nature of the blood-stains, image under the bloodstains?? Pollens? Was there a reweave? And so on, and so on, and so on. Radiation? Maillard? Unrepresentative sampling? Miracle? Forgery? Naturalistic? We thought STURP had provided answers in 1978. The C14 labs thought they had the answer in 1988. Now we seem certain of nothing about it at all. And that’s all without even touching on the historical aspects. Would a more structured approach get any further? A research foundation under the auspices of the Pontifical Academy of Sciences? It would need a huge endowment to make any progress. That might mean big corporates becoming involved. Meantime we have all these little disparate cells pursuing their own private theories. Getting nowhere! Books on it churned out by the dozen. Little agreement. What’s the answer? Our brains are so complex and goes in many directions. How can we minimise or maximise the Objective Function. But it is so complex that as there are so many variables and so many constraints. So we will never get an answer from the data availble. Based on my wisdom I think Image on the Shroud of Turin is not a man made one. If it a man made one then today with our knowledge in science and technology we would have produced more than Billions of Shroud of Turins. So only solution is, hope, one day Church authorities will allow scientists to do more testing to do to determine the age of the Shroud of Turin. I concur with your assessment. The mystery deepens. Let the Shroud speak . I would enjoy a discussion by this group on the nature and physics of the Transfiguration. My speculation is that whatever energy emanated then may have been similar at the resurrection. A different sub-atomic particle being released? Neutrinos? A good read – The Physics of Christianity by Frank Tipler. Intriguing. The forensics still offer the greatest clues. I have yet to see ANY artistic rendition of a brutalized corpse with the details on the Shroud. Rogers indicated that the mailiard reaction alone was not an answer to the issue of image formation. I wonder if the answer maybe quite simple. It was light. Originally the linen shroud was white. Agreed? Over the ages it darkened and the fading of the “image” is in part at least to a lost of contrast as the linen darkened. Am I wrong that one thing that can darken linen is light, just ordinary see it every day sunlight. Once as a child I toyed with developing photographs. They has to be “fixed” lest they faded. The impact of light on any object would depend on its chemical composition. Other times light might bleach a material. Sometimes it would darken, sometimes it could bleach. When the drawing called “La Bella Principessa” was subjected to Multispectral Digital Imaging (MDI) they had to use special lighting designed to prevent damaging the drawing. St. Paul’s claimed the appearance of Christ to him was in a bright blinding light. Visible light, which is presumably what St Paul and the witnesses to the transfiguration saw, is part of the electromagnetic radiation spectrum which includes heat (infra-red) and Paulo di Lazzaro’s UV laser. Depending on its wavelength, intensity and duration, deterioration of linen is certainly possible, and in some circumstances, as di Lazzaro has shown, results very similar to the discolouration of the Shroud can be achieved. The first question is then, where did the ‘light’ come from? The problem here is that except in very peculiar circumstances which I shall describe below, it could not have come from the object making the image (such as the body of Christ). If you expose a piece of photographic paper to a lamp in a dark room, you do not get a photo of the lamp, just a white blur, as rays from all over the lamp spread out and affect all over the paper. Even if you place a luminous mask on a piece of photographic paper in the dark, you do not get a photo of the mask, although a vague outline of its shape might be possible. This is because the light from all over the mask radiates in all directions. The peculiar circumstances mentioned above would be that if the rays of light from every point on the object all emerged and travelled in exactly the same direction, and if the intensity of the ray from each point diminished according to its distance from the cloth, then indeed, you might get a photo of a lamp or a luminous mask just be exposing it to a photosensitive sheet. There is no known way to achieve this, although Giulio Fanti’s coronal discharge experiments have been exploring the idea. The second question is, can a live, dead, supernatural or earthquake stimulated body produce the appropriate radiation (such as heat, light or UV) with appropriate qualities. So far, there is no known way. I would be a fool to claim I have solved the mystery of the Resurrection but not a fool to point out the known circumstances of the image are consistent with the Resurrection – The body transforming or transporting into a different dimension or level of existence. The image which appears to have been created in a micro-second (Rogers) would be the last instant before that transformation or transportation was complete. A literal event horizon becasue we can not today view or even comprehend where the the body went or how it was transformed. There are some who insist that science can never get to that point. I would suggest that the history of science particularly in the last two centuries has pushed the boundaries of science far beyond what was imagined previously. Evolution is one such but we know that the Darwin’s survival of the fittest is only a partial answer to the process of evolution. Someone was labeled my thoughts as Chardinian as in Pierre Teilhard de Chardin (I believe it was a compliment). I plead guilty for Teilhard envisioned a coalescence of science and faith both dependent on the other, both illuminating the other. What is the history science but an exploration and revelation of the wonder and magnificence of our existence; a journey that has not been concluded and may never end. I expect to be blogging on this in the near future for there is one thing I have concluded: that Shroud is authentic and what that means. Some may disagree. Real-Time Visualization of Joint Cavitation. the true age of the Shroud. >Recently Blum, Katz and Waxman have claimed that the flux of high energy cosmic ray (CR) positrons near Earth that has been measured with the Alpha Magnetic Spectrometer (AMS) aboard the International Space Station can be produced in the collisions of Galactic CR protons and nuclei with the ambient matter in the Galactic interstellar medium (ISM).Their claim was based on an alleged “robust upper limit to the positron flux” which neglected the energy loss of e+’s in the ISM. Inclusion of this energy loss, however, yields a much smaller upper limit, which excludes secondary production in the ISM by the Galactic cosmic rays as the main origin of the CR e^+ flux above 10 GeV. Don’t you want to think to improve the health? In my opinion there are many points of the events of 2000 years ago that are a little unclear. For example: Our Lord Jesus Christ had a foster father: St. Joseph. However: where is the tomb of St. Joseph? Recently I read a short service on the ancient cult of St. Joseph in Palestine. Along with the article was a picture of the so-called Tomb of the Right or of St. Joseph (which exists at the convent of the Sisters of Nazareth), the text was also quoted an ancient document called Judeo-Christian “Historia Josepi”. The Dominican Milan IsidoroIsolano inserted the History of St. Joseph in his “Summa de donis St. Joseph”, printed in Pavia, in 1522. And in that work the story of Joseph’s life is attributed to Jesus himself, who would confided to the disciples on the Mount of Olives. IsidoroIsolano, who wrote the Summa of the gifts of St. Joseph, said that there will come a time when you will discover riches enclosed in St. Joseph. The Gospel of St. Matthew informs us that the death of Christ, “the graves were opened and many bodies of the saints who had died, resurrected. Coming out of the tombs after his resurrection they entered the holy city and appeared to many “… So: St. Joseph was among them? Another question: the Blessed Virgin Mary, the Holy Mother of Jesus, is seen by some as the dying and then resurrected and went to heaven. Others (here I refer to one of the many responses given by Our Lady in Medjugorje) seem to deny that Mary is dead! Then: the Blessed Virgin Mary was dead or simply “asleep”? I don’t put myself against the Truth of the Faith, but I see that some mysteries still seem to remain unresolved. Should we add mystery to the Mysteries? I do not think this is the right way to go toward the Truth. But this thing is not so much curious and it seems a little bit vulgar. The right word to write was “cantilevers” and not “tips”! If we have some time at disposal we can also try to think to the possibility to build a MEMS device, a sort of “MEMS watch”, where a micro-nanomanipulator is used to deform a linen fibrils (a sort of “cantilever”) for flexural controls in AFM tests… in order to know what is the probable epoch of the ancient textile material.